Even beginning gardeners can easily incorporate hen and chicks cactus plants into the garden. These low-growing succulents thrive in well-drained soils and sunny locations. With some simple basics, you can grow hens and chicks cactus plants and even propagate them to start new clusters. Hen and chicks (Sempervivum tectorum) date back to ancient times. European peasants planted hen and chicks among the reeds on their thatched roof homes, creating a plant-based fire retardant. 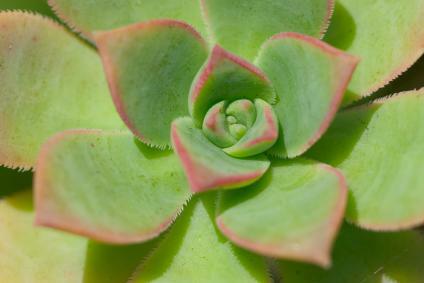 Succulents such as hens and chicks cactus plants retain water in their leaves. They catch fire at a slower rate than dried thatch, thus creating a natural firebreak. Modern gardeners enjoy hens and chicks as rock garden and alpine garden additions, or as edging plants in the sunny border. Succulent aficionados prize hen and chicks for their interesting shapes and colors. Foliage colors range from bright green to dark burgundy. Plants are sold in containers at garden centers. Although the plant appears small, they grow quickly under the right conditions. The main 'hen' will produce many offspring, called 'chicks', until she goes to seed. Once the main hen creates seeds, she dies back, leaving the next generation to carry on her genes. Hen and chicks cactus plants are one of the least fussy garden plants and thrive under a variety of conditions. They can be grown in zones 3 through 11. Hen and chicks prefer bright, full sun for six hours or more a day. In garden zones 8 through 11, they benefit from some afternoon sun, especially during the blistering summer months. Like cactus, hen and chicks require well-drained soil. If your garden contains heavy clay soil, amend the soil with compost or other matter. Any accumulated water will destroy the plants. They thrive in poor, sandy, and rocky soil. Use hens and chicks in areas where you have trouble growing other plants. Many gardeners find that these succulents love areas that other plants hate. Hen and chicks tolerate a neutral pH between 6.6. and 7.5. Have the soil tested at the local cooperate extension office and incorporate the amendments they suggest to raise or lower the pH as needed. Hen and chicks look great in alpine gardens and rock gardens. To plant them among rocks, place the rocks so that they look natural. Add soil on top of the rocks and among the crevices, and plant the hens and chicks so that the crown is level with the soil. Space the hens and chicks plants between three and twelve inches apart. Leave plenty of room for larger varieties. Hen and chicks spread easily, and create clusters of attractive plants. Apartment dwellers can also grow hen and chicks in pots called strawberry jars. These clay pots have a central opening at the top and many side pockets. Place one hen and chicks plant in the top of the pot, and as the offspring develop, simply place them in the side pockets. Soon you'll have a lush container that's great for an apartment balcony or patio. Hen and chicks are one of the easiest succulents to propagate. As the plant matures, the main 'hen' sends off runners, producing the 'chicks' or baby plants. Simply remove the offspring and plant in a new location to create additional hen and chicks for your garden. Adventurous gardeners can grow hen and chicks plants from seeds, available through seed exchange networks, garden centers and catalogs. If growing hen and chicks cactus plants intrigues you, try one of these varieties. You can easily find hen and chicks at a local garden center or order them from one of the many mail order and online plant companies. Grey Dawn. The leaf color on Grey Dawn is a striking grayish green, with other colors tinting the leaves during the cooler weather. Purple Beauty. Bronze-purple leaves adorn this hardy variety. Commander Hay. If red's your color, try this burgundy leaf hen and chicks plant. Dave's Garden provides the bare essentials about hen and chicks plants. Children love hen and chicks plants, and Fun Family gives instructions on how to plant hen and chicks in a pot as a children's fun learning adventure.